Laptops like Apple's MacBook Air have proved that thin is in even in the business world, and HP looks to up the ante for enterprise users with its slimmest EliteBook yet. Announced at the company's own HP Discover 2013 in Barcelona, Spain, the EliteBook Folio 1040 G1 packs productivity potential in a 15.9mm thin chassis weighing 1490g. With a footprint that feathery from a 14-incher, it's clear that the latest in HP's line of sleek mobile workstations is all about merging form with function. When it comes to form, the HP is swiftly catching up to consumer leaders like the Samsung ATIV Book line and Acer's Aspire S7. According to the company, the EliteBook Folio 1040 G1 is 16.1 percent thinner and 7.3 percent lighter than the previous EliteBook. And with a full magnesium alloy finish in a deep gray hue from its lid to its spill-resistant, island-style matte keyboard, this ultrabook is quite the looker. As for function, HP can pack the EliteBook Folio with up to a dual core, 2.1GHz Intel Core i7 4650U CPU with Intel HD Graphics 5000 and backed by as much as 8GB of DDR3 RAM at 1,600MHz. An SSD as large as 256GB will accompany those powerful innards. Of course, 802.11a/b/g/n Wi-Fi comes standard, but Bluetooth 4.0 and 4G LTE are available as well , if you so desire. Finally, a fingerprint reader comes optional for those willing to pay up for peace of mind. With just two USB 3.0 ports, a DisplayPort, headphone/microphone combo jack, a 3-in-1 card reader and a side docking connector, the EliteBook Folio is victim to its own svelte form factor. Yet, this ultrabook manages to one-up the MacBook Air, which lacks docking capability altogether. 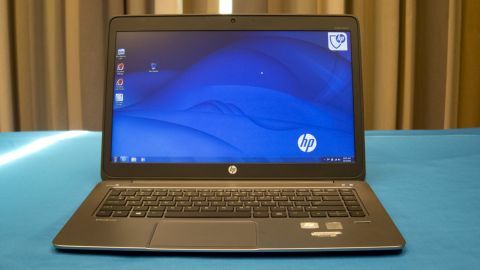 HP's attempt to meet form and function comes through most in the EliteBook Folio's ForcePad. This Synaptics-built touchpad eschews the mechanical click of most single-button touchpads and instead uses four pressure-sensitive sensors under the capacitive sensor array. The result is impressive, albeit unnecessary, in HP's first-ever go at the technology. Increasing pressure in any direction on the right side of the touchpad -- rather than glide two fingers -- to scroll displayed pinpoint accuracy. And applying pressure to an icon for simple "click and drag" gestures was a breeze. The ForcePad will evoke some "oohs" and "ahhs", but this new approach brings a learning curve. It simply feels strange to press down and feel nothing, despite Synaptics's audible "click" that comes from the speakers whenever pressure is applied. Artists and creative professionals might appreciate the ForcePad. But touchpads are fine the way they are, especially for the enterprise crowd. HP promises "all-day battery life" from the EliteBook Folio, which will be the true test of whether this ultrabook offers the best of both worlds. With a Haswell chip and SSD on its side, the EliteBook Folio could very well deliver. And perhaps by that time, the Force(Pad) will grow stronger on us. At first glance, the EliteBook Folio 1040 G1 is one gorgeous workhorse, with its magnesium enclosure super slim profile. Once you get your hands on it, it's clear that this ultrabook means business, especially with its fresh ForcePad tech. While the ForcePad is impressive, we're still on the fence about whether this touchpad approach adds anything to the computing experience. Plus, that the EliteBook Folio's gorgeous 1080p, UWVA display isn't standard (base configurations start with a 1600 x 900 SVA panel) is a bummer. HP's promise of "all-day battery life" doesn't mean much right now, but already pits this $1,299 laptop against the MacBook Air and Samsung ATIV Book 9 Plus. We'll be the judge of whether the EliteBook Folio can hang with the big boys in our full review.